Undoing Citizens United, the DIY guide. Justice John Paul Stevens had seen a lot of precedent overturned by the time the Supreme Court ruled on Citizens United v. Federal Election Commission in January 2010. Appointed to the court by Gerald Ford after a career as a distinguished Republican jurist, he’d been there for contentious cases on abortion, the death penalty, Gitmo, you name it. But none had prepared him for the way the court’s new conservative majority, led by John Roberts, seized on an obscure campaign finance case expected to produce a narrow ruling and used it to shred nearly four decades of federal law. The majority opinion in Citizens United takes up 57 pages, but it’s pretty efficiently boiled down as follows: (1) Money is speech; (2) corporations are people; (3) therefore, under the First Amendment, the government can’t stop corporations from spending money on politics pretty much however they choose. Stevens wasn’t the only one appalled. Citizens United set off a torrent of outrage, culminating in the high drama of the president (a constitutional law professor, lest we forget) condemning the court in the State of the Union for opening “the floodgates for special interests—including foreign corporations—to spend without limit in our elections.” Anger spanned the political spectrum (80 percent were opposed shortly after the ruling, 65 percent “strongly”) and helped spark the Occupy movement. But Americans’ disgust didn’t stop the bagmen, on both sides of the aisle, from seizing the opportunity. Just ask Dan Maffei, a Democrat in upstate New York’s 25th District who led Ann Marie Buerkle, a pro-life activist with scant political experience, by 12 points two weeks before the election. Then Karl Rove’s American Crossroads buried him with $400,000 worth of attack ads—and Buerkle won by a mere 648 votes. Constitutional amendment: Okay, it takes two-thirds majorities in both houses of Congress and ratification by three-fourths of the state legislatures. Nevertheless, we did just that to bring about Prohibition in 1919 and then to overturn it in 1933, and to lower the voting age to 18 in 1971. That last one wrapped in a mere five months; then again, the 27th Amendment, which regulated congressional raises, was in the works for 203 years. And recall the Equal Rights Amendment: “Men and women shall have equal rights throughout the United States.” No-brainer, right? The ERA passed Congress in a landslide in ’72 (354 to 24 in the House, 84 to 8 in the Senate). It was endorsed by Richard Nixon, included in the Republican Party platform, and ratified by 30 state legislatures within another year. And then Phyllis “Stop Unisex Bathrooms!” Schlafly whipped up a major froth, got enough culture war firebrands elected to state legislatures, and stopped it cold. So yes, it’s technically possible to pass an amendment clarifying that corporations are not quite the same as people and money is not quite the same as speech. (Several organizations, including People for the American Way and a new outfit called Move to Amend, are pushing for this.) But there’s also a lot of dark-money groups waiting to underwrite a Schlafly-like play. SCOTUS deathwatch: How about waiting for a conservative justice or two to die while Democrats hold the White House and the Senate? Yeeaah. Absent the plot devices of a John Grisham thriller, don’t hold your breath. Then again, know who’s been the master of this kind of waiting game? The folks who brought you Citizens United. When he started flooding the docket with anti-campaign-finance-regulation cases in the 1980s, conservative lawyer James Bopp Jr. was facing a hostile court. But he kept at it until the majority shifted—and slammed the ball he’d teed up. Let the sun shine in: In the nearer term, there’s the option the Roberts court expressly invited in Citizens United—full-monty disclosure. Not long after the ruling, Rep. Chris Van Hollen (D-Md.) introduced the DISCLOSE Act with 114 cosponsors, just two of them Republicans. It would have banned most secret donations, forced companies to report their giving to shareholders, and shut foreign corporations out of electioneering. The bill’s life was brief and full of ironies (among the clauses tacked on in the House was one exempting the NRA); it passed the House in an anemic 219-206 vote—36 Dems voted nay—and died, as all good legislation must, when the Senate fell one vote short (RIP Ted Kennedy) of a filibuster-proof 60 votes. Van Hollen has reintroduced the legislation, and with Sen. John McCain back in the reform business, it might just stand a chance. But Congress is not the only game in town. Court after court has come down squarely on the side of disclosure, and in May, the DC court of appeals ruled that nonprofits like Rove’s Crossroads GPS and the US Chamber of Commerce must reveal their donors’ names. In another promising step, the IRS has made noises about revoking the tax exemption of dark-money groups. Taxpayer-financed campaigns: No one likes big money in politics—least of all, perhaps, members of Congress who toil in the Hill’s drab call centers, dialing donors to beg for cash. That’s why public financing was key to the post-Watergate reforms, and until billionaire Steve Forbes opted out in 1996, every major presidential candidate took it. But the system failed to keep up with the cost of elections; this year, candidates could hope to get about $90 million in public financing, whereas Obama expects to raise up to $1 billion. Nevertheless, public financing can still make a big difference in down-ballot races, from the statehouse all the way to obscure but critical judicial elections. And keep in mind, today’s state legislator is tomorrow’s US senator. As the rich get richer, throwing six-figure sums at presidential campaigns is just like tipping for good service. In the end, all these avenues need to be pursued, and here’s why: As Paul S. Ryan of the Campaign Legal Center told MoJo‘s Andy Kroll, the right “recognizes something that few on the left recognize: that campaign finance law underlies all other substantive law.” In other words, no matter what you care about—climate change, abortion, taxes, net neutrality—it all comes back to who pays for our elections. Need a more selfish reason? Because the 1 percent have bent the system to their advantage, America’s median household income—your income—is $40,000 lower than it would have been had incomes continued to keep pace with economic growth. Conversely, as the rich get richer, throwing six-figure sums at presidential campaigns is just like tipping for good service. Snake, meet tail. Ready to explore for yourself? Here’s choose-your-own adventure guide to the options, with plenty of links to more resources. 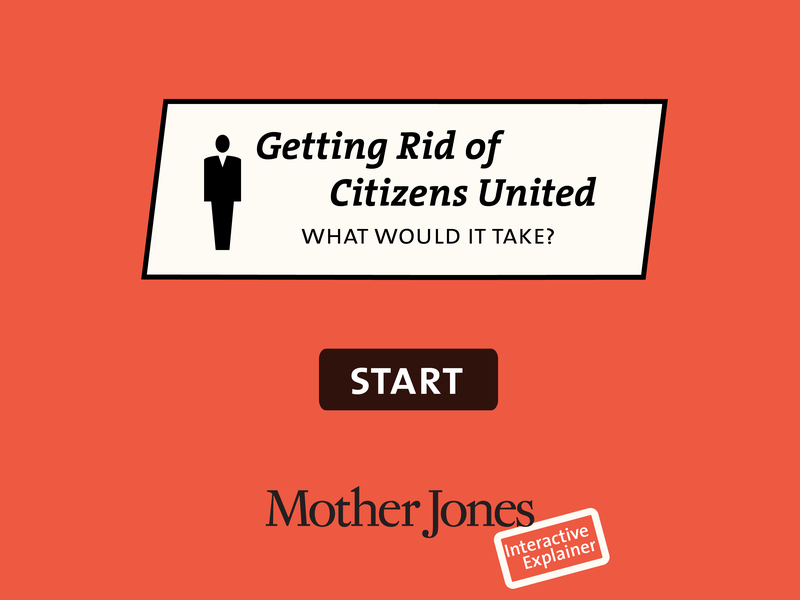 Do you hate the Citizens United ruling and how it led to the flood of unlimited super-PAC spending? No, I think it’s just dandy. While we’re at it, would you also like to get rid of the remaining limits on campaign contributions to politicians? Who cares, now that there are super-PACs (and super-duper-PACs)? You think our campaign finance system is perfect as it is. May the candidates with the richest supporters win! the money behind the 2012 race. You’re not alone. Mitt Romney, Newt Gingrich, Ron Paul, and megadonor Foster Friess have said they want to get rid of those pesky limits on how much individuals and corporations can give to candidates. (On the bright side, that might make super-PACs obsolete.) But you’ll have to wait for the Supreme Court to step in again. You may not have to wait too long. Do you think the Supreme Court will change its mind and reverse Citizens United? Yes. The justices will realize what a mess they’ve made. No, the court is a lost cause. Reality check: Chief Justice John Roberts is 57. In the meantime, do you want to focus on undoing Citizens United or tweaking the campaign finance system? Undo the whole darn thing. Do you want to focus on undoing Citizens United or tweaking the campaign finance system? While you’re thinking big, do you also want to take down the corporate personhood concept that made Citizens United possible? No, let’s focus on Citizens United. Reduce the influence of big donors. Make it harder to hide dark money. Reform advocate Lawrence Lessig has proposed a system in which every citizen gets a $50 voucher to give to any federal candidates who agree to accept only vouchers and small donations. But could these candidates compete with super-PACs? Want to try another reform? Want to take down Citizens United? Why not shine some light on dark money? Shareholders could demand that companies disclose all of their political spending. The DISCLOSE Act would make shady 501(c)(4) groups reveal their major donors—but it’s stuck in Congress. To end the legal concept that “corporations are people, my friend” (as Mitt Romney put it), you’re going to need a constitutional amendment, like the ones proposed by Sen. Bernie Sanders (I-Vt.), Rep. Jim McGovern (D-Mass. ), Rep. Ted Deutch (D-Fla.), Free Speech for People, and Move to Amend. Okay, let’s go pass an amendment. You’re going to need a constitutional amendment. Anti-Citizens United amendments have introduced by Sens. Chris Dodd (D-Conn.) and Mark Udall (D-Colo.), Rep. Kurt Schrader (D-Ore.), Rep. Donna Edwards (D-M.D. ), and Move to Amend. Fun fact: Only 27 of 11,447 attempts to amend the Constitution since 1787 have succeeded. How do you want to get your amendment passed? Only Democrats (and independent Sen. Bernie Sanders) have sponsored the current crop of constitutional amendments. Do you really think two-thirds of the current members of Congress will vote for yours? A grassroots movement could send a message to Congress. More than 1 million people have signed petitions against Citizens United. Dozens of cities and states have passed resolutions rejecting CU and/or corporate personhood. Eleven state attorneys general want to reverse Citizens United. Will this convince Congress? Yes! Congress is on board. What’s next? No. We need new pols in Congress. Throw the bums out! Too bad unseating incumbents who benefit from the current system costs a ton of money. You could always form the world’s most ironic super-PAC. But assume you elect a new Congress that supports your amendment. Now three-quarters of state legislatures must ratify your amendment. All 27 amendments to the Constitution have been passed this way. Don’t get too excited: remember the ERA? Does your amendment pass? Nope. Let’s hold a constitutional convention. Good luck with that! No amendment has ever been passed this way. First, two-thirds of states must call for a convention. At the convention, three-quarters of the states must approve your amendment. Does your amendment pass? Yes, and I just saw a unicorn! No. Let’s see if Congress will bite. There have been more than 11,000 attempts to amend the Constitution since 1787. You can either go through Congress or hold a constitutional convention. Which would you rather try? Congratulations! Your anti-Citizens United amendment has passed, ushering in a new era of sensible campaign spending and grassroots democracy. Well, at least until a new loophole is found. Read more of MoJo’s coverage of the money behind the 2012 race.